HDR stands for high dynamic range and refers to a process by which multiple pictures are taken of the same thing at different exposures – typically a normal, balanced, exposure and then one or more that are under- and over-exposed. The multiple exposures are then combined using software to produce a single image with greater dynamic range than the camera could have produced with a single original exposure. Actually, that last statement is not true. We don’t increase the dynamic range of an image, we decrease it. Think about it. 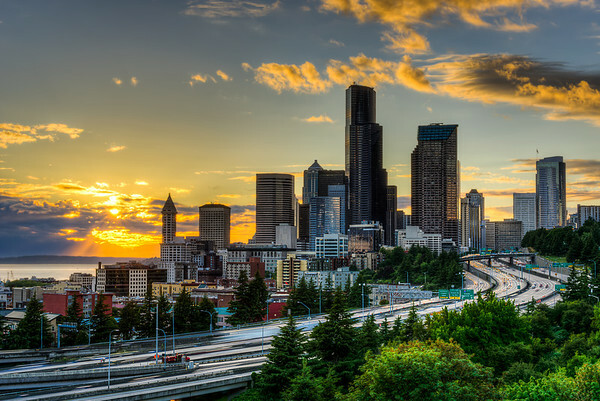 The reason we use the HDR process in the first place is because we want to capture a scene where the dynamic range exceeds our camera’s capabilities. Also, the highlights are brighter and the shadows are darker than our monitors can display and printers can print. That’s not going to change. When we create an HDR image we’re actually compressing the dynamic range into something that can be displayed and printed. We make the shadows less dark and highlights not as bright so that we can see details in those areas. Why would anyone do this? Well, dynamic range is the total amount of light (from dark to bright) a camera can capture at a given time. Some cameras are better than others (meaning they have a greater range), but for some scenes there will usually be something that is either really bright or really dark that the camera’s sensor just can’t fully capture. Photographers talk about blown highlights or hidden shadows when referring to things that are either so white or so black that all details is lost. Think about pointing your camera directly at a sunset. The sky will probably be pretty bright, but everything in the foreground will be pretty dark. This scene is said to have a high dynamic range because the difference between the brightest stuff and the darkest stuff is so great. The camera isn’t going to be able to properly expose for everything – you’ll either get an okay sky with everything else pitch-black, or you’ll get an okay foreground with the sky glaring so bright your retinas go on strike. Instead of trying to capture the entire dynamic range with one exposure, we can capture pieces of it with different exposures and then put them together later. We take one or more under-exposed (darker) pictures to get all the highlights, one or more over-exposed (brighter) pictures to pickup the shadows and a middle exposure to get everything in between. Got it? Good. Here’s some pictures . . . This is the first HDR image I created. It was an excellent learning experience for multiple reasons. There was definitely a high dynamic range to be captured – it was a (rare) bright, sunny day and this was under a shadowy dock with countless holes and angles where the light could get in. A single exposure could never have gotten the detail in the sky and backgroud as well as the shadows in the wood grain, for example. Another opportunity for learning presented itself during post-processing. There was a strong amount of chromatic abberation present in the combined image. To get rid of these insidious lines of color along the high-contrast edges I had to “blend” the HDR image with one of the originals. Here’s the scene: After a long and dusty ride through the desert in a TOMCAR, I finally had some time to take a few pictures. This wagon was politely sitting still for me. The sun was setting behind me, making this a directly front-lit subject, and a full moon was rising in front of me (funny how that works). So this wagon was sitting there being brightly front-lit by the setting sun and dimly back-lit by the rising moon presenting all of its great little details like wood grain and rust. The tricky part here was the fact that there was so much evidence of civilization around – there were cars, people, equipment and power lines everywhere. That’s what led to this less-than-ideal composition; it was the best angle I could find to mitigate the incursion of the modern world. Post-processing turned out to be a snap because the combined image already looked pretty good. In fact, I actually had to decrease the vividness of the colors because it just looked too fake. The green stuff on the side of the wagon looked like radioactive goo, and the wheel rims were as red as candy cane stripes. The only real hassle with this image was dealing with the amount of dust that had gotten on (and IN [yikes]) my camera during the aforementioned TOMCAR ride. We were on the Vashon Garden Tour 2011, and I think this was the last stop. After seeing all the flowers, plants and lawn ornaments at this location, we were just about to exit when I turned around and saw this beautiful house. It might be a guest cottage, separate from the owners’ main home. I was a-hankerin’ for some HDR material (to which flowers do not typically lend themselves) and decided to take a chance on this scene even though I didn’t have my tripod with me. This was my first attempt at taking a hand-held HDR series. Since we need to layer multiple images of the same thing on top of each other, they need to be pretty spot on as far as alignment – any movement between (or during) the exposures would throw off the whole thing. Luckily the sun was strong enough and provided enough light so that the exposures fired off pretty quickly. So, this attempt showed me that hand-held HDR is possible. My good friend Arline asked if I’d bring my camera gear over to her place and take a few pictures that she could use in the selling process. At the time, this would have been my first “professional” photography job, so I jumped at the chance. It was quite an eye-opening learning experience to say the least. I am so grateful she gave me the opportunity to develop the soft skills required for some photography assignments. HDR lends itself perfectly to this type of photography. It allowed me to take exterior shots on a bright, sunny day and still get the details of all the landscaping. Inside, we needed to handle the sunlight coming in the windows, overhead light coming from the, um, overhead lights and all the shadows created by the furniture. Another huge oppotunity for growth came when I presented the first processed images to my “client”. She liked them and agreed they were very pleasing to the eye. “But,” she said, “That doesn’t look like my house.” Indeed, I couldn’t help imposing an artistic flare on the images. The problem was that we were not creating art; we needed to accurately display the house to potential buyers. So, I had to force myself to put fine art photography aside and deliver pictures that made the house look as good as possible while still being true-to-life representations. People seem to like pictures of old barns and farming equipment, and I am no exception. Perhaps it’s a connection to our agrarian past. The stuff just seems to age well, gaining character over time. I had the opportunity to visit Heidi’s family farm in Rosemount, MN where I was treated to a wonderland of farming implementations. Most of the set was taken just after sunrise. Being Minnesota in the summer, it was already sunny and hot at 7:00 am. The ground, however, was still quite covered with dew, and I spent the morning sloshing around with my tripod to see all the angles. Inside some of the disused structures, my tripod also served as a spider-web blocker and varmint disperser. Perhaps Manfrotto will include these features in its product descriptions. You can see more of the “Farm Series” at my smugmug site. In the spring of 2012 I found myself in the very photogenic city of New Orleans. Although I was there for a business conference that had nothing to do with photography (well, two back-to-back conferences actually), I made plenty of time to get out and make as many images as possible. It was my first full day in town when I set out to photograph the inside of a cathedral. As luck would have it, the hotel at which we were staying was a few blocks from St. Patrick’s Cathedral in the Business District. On a sunny afternoon, I lugged my gear about ten blocks to the front doors of this large and stately church. That’s when I encountered my first challenge – how to get in. Using the large front doors was too obvious I guess, because they were locked even though the hours of operation said the church was currently open. Mass had recently ended, so I figured this would be the perfect time to get in there. The building takes up almost the entire city block, so I circumnavigated it more than once looking for access. Eventually I found a courtyard that led to a door that got me in. Now the second challenge. It was deathly silent inside. Silent, that is, until I walked in. Every step on the marble floor reverberated throughout the nave. The unzipping of my camera back sounded like a giant ripping up his junk mail. There were two people inside at the time – a guy praying in the back row and the Father sitting in the front (he’s in this picture). I was trying to be as quiet and respectful as I could, knowing that my squeaks and creaks thus far would pale in comparison to the sound of the shutter opening and closing on my D700. And that’s exactly what happened. With tripod and camera setup, I set my intervalometer to take 7 exposures and stood back. The clicking noises were tremendous. Each open-and-shut click-click sound echoed off of every surface. When the series was over, I was sweating in my nervousness. I figured I’d keep shooting until someone asked me to leave. 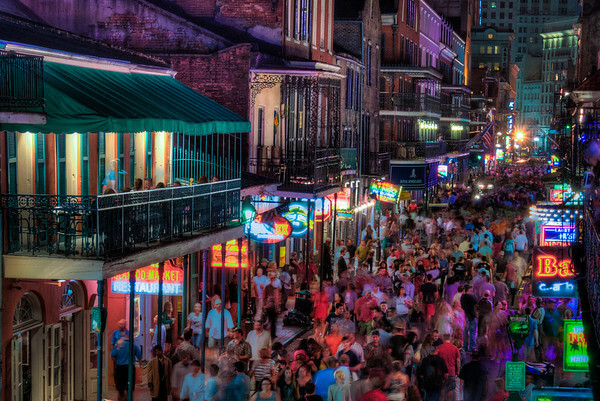 Please see my New Orleans gallery for many more HDR images of this fabulous city. It is my personal opinion that to say you hate HDR is silly. The HDR process is a technique, and we use tools to accomplish a goal. I forget which famous photographer said that, in photography, failure is always an option, but this absolutely applies to post processing. Anyone can make a bad image using a variety of techniques – HDR proessing is not special in this category. To say that you don’t like HDR in and of itself is like saying you don’t like images shot using a polarizing filter or ones processed with a particular software filter. 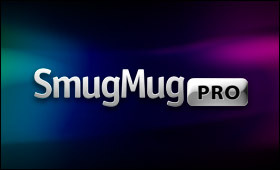 These are all tools that can be used to create beautiful images or, if misused, junk. I will admit, though, that the HDR process makes it much easier to produce eye-wateringly bad images. You can go from SOOC to crap in a matter of seconds (depending on your hardware) if you’re not careful. My point is that it’s possible to produce both great and not-so-great images using any of the post processing tools at our disposal. HDR is simply one of those tools. I wasn’t even going to take this shot. 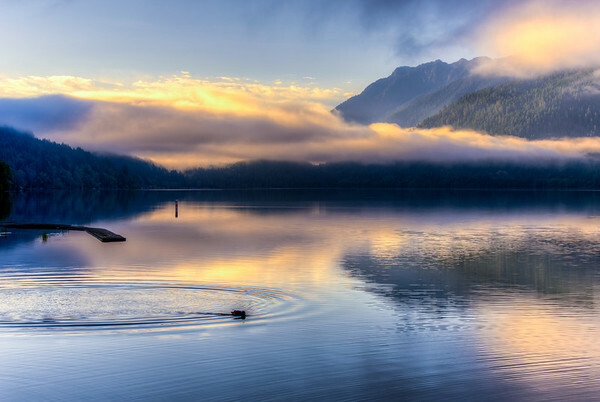 Another photographer was up with me before dawn at the beautiful Lake Crescent in the Olympic National Park. We were pretty much the only two people out there and eventually got to talking. He started the interaction by noting that were were using the same cameras. A short time later, when we were standing near each other with our tripods, he asked if I was shooting bracketed sets. SInce I wasn’t, I told him “No.” I could hear his camera firing three times every time he took a picture, so I assumed that he was shooting brackets. However, knowing that he was also using a Nikon D800, I knew that he could only be shooting with a maximum of 1 EV spacing – not enough to make shooting for HDR worth the effort. I asked him if he was shooting for HDR, and he said “Yes.” I couldn’t help but try to help him since the clicking of his shutter kept telling me he could be doing better for himself. So I did a mini-workshop with him on how to use the intervalometer on his camera. My camera just happened to be pointing at the scene above when I fired off the exposures, and that was the result. Eventually it became one of Photo Camel’s Photos of the Week. When I finally made it to the 12th Ave. Bridge it was to shoot long exposures of the traffic moving in and out of the city. Because the sun sets so late at this time of the year, I found myself standing there for a some time waiting. So, of course, I took pictures, including this 7-exposure series of the city before the sun completely set. Merged using Photomatix Pro, I turned the de-ghosting functionality off for this one. This was captured under some amount of duress. I was on a second-story with many co-workers as part of a business conference. It was crowded, and my colleagues were in full revelry. This was originally shot in portrait (vertical) orientation, but I felt it looked better with a landscape crop. Since I thought the contrast between the people moving on the street and the static buildings would look interesting, I again left de-ghosting turned off. This is the first stop on the Seattle Underground tour. If ever there were a situation that needed HDR treatment, it is this: There is NO ambient light – it’s either really dark or really bright from artificial lights, nothing is moving, and there is a lot of detail to be captured and seen. 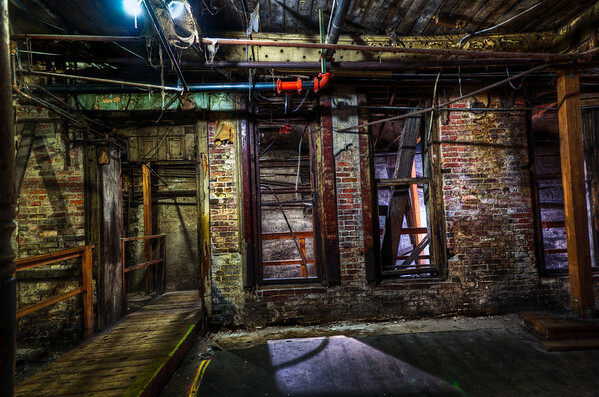 Feel free to check out the full Seattle Underground gallery where all of the images are HDR. 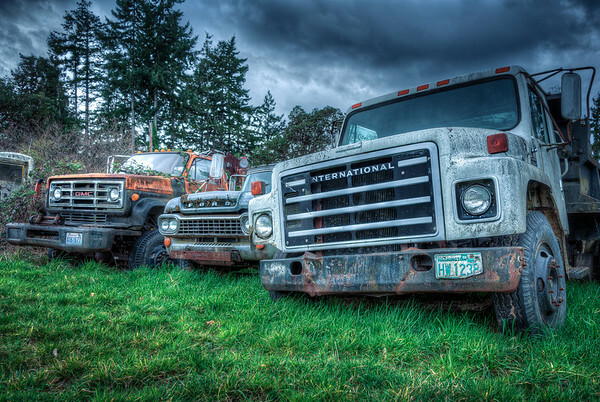 Located on Vashon Island, Washington, the Engles Repair Yard is home to a wealth of classic cars, trucks and other vehicles that are aging gracefully on the property. I’m not sure the proprietors fully appreciate the beauty of what they have out there, and being allowed to take pictures has become increasingly difficult. Still, I managed to get in (legally, with the owner’s permission) on two occasions. The images in this gallery are decidedly artistic in nature. I wasn’t going for strict realism, but rather a feeling of . . . well, that’s up to you.